With very little fundamental news today and with the G20 having passed off as a damp squib, the forex markets are now concentrating the significant fundamental news which for this week will, no doubt, be dominated by the non farm payroll date due out on Friday. 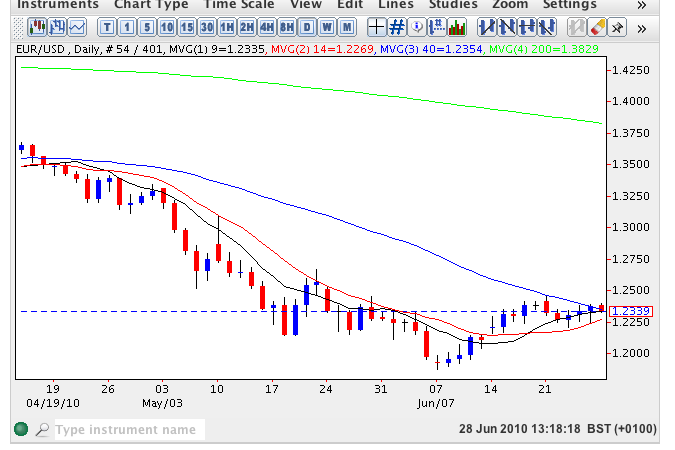 Last week’s price action was desultory in the extreme with the euro vs dollar entangled by the 40 day moving average above and the 9 and 14 day moving averages below. For any change to the present sideways consolidation we need to see a break and hold above USD1.25 to the upside or a break below USD1.2150 to the downside and based on the current forex chart pattern for the pair either scenario is possible. All the fundamental news for the week can be found on my new forex trading site.